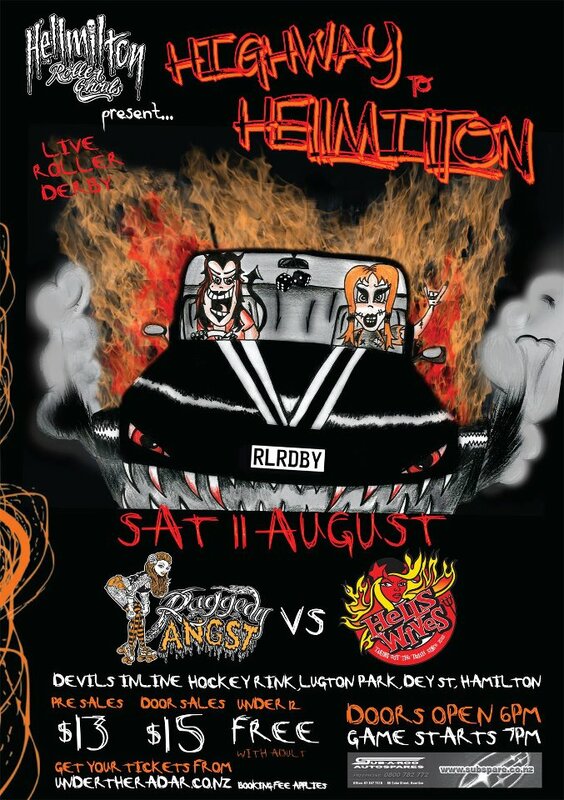 Our next bout is on the 11th of August and this time Hells Wives are off to Hamilton to take on Hellmilton Roller Ghouls’ Raggedy Angst, complete with the extremely loud and mega-enthusiastic Hells Wives Barmy Army in tow! Last year Raggedy Angst took out the win when they paid a visit north; this time Hells Wives are ready to take that win back…hell yeah! Bout is at Devils Skate Rink, Dey Road, Lugtons Park, Hamilton. Doors open at 6, game starts at 7pm. For more details check out the bout Facebook page event. This entry was posted on July 25, 2012 by nnderby. It was filed under EVENTS! and was tagged with hellmilton roller ghouls, Hells Wives, Northland Nightmares, Northland Nightmares Roller Girls, Northland Nightmares Roller Girlz, raggedy angst, Roller Derby.